Visual Studio Code>Programming Languages>Scala (Metals)New to Visual Studio Code? Get it now. Metals is still in early development so you may run into rough edges. The following table shows the status of various features. Import build ✅ Works with sbt and Bloop. Compile errors ✅ Syntax errors as you type and type errors on file save. Goto definition ✅ Works for project sources and Java/Scala library dependencies. 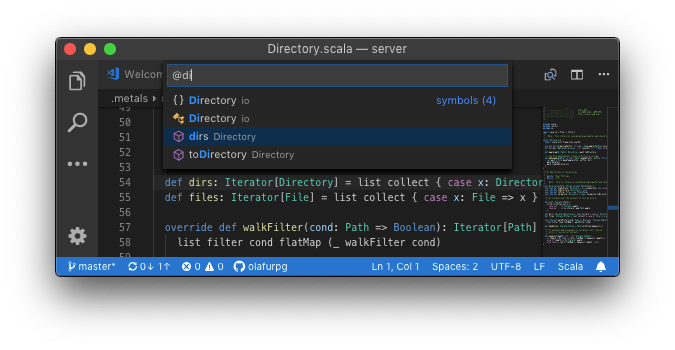 Workspace symbol ✅ Searches workspace sources and library dependencies. All-lowercase queries are case-insensitive. OpenJDK or Oracle Java 8. 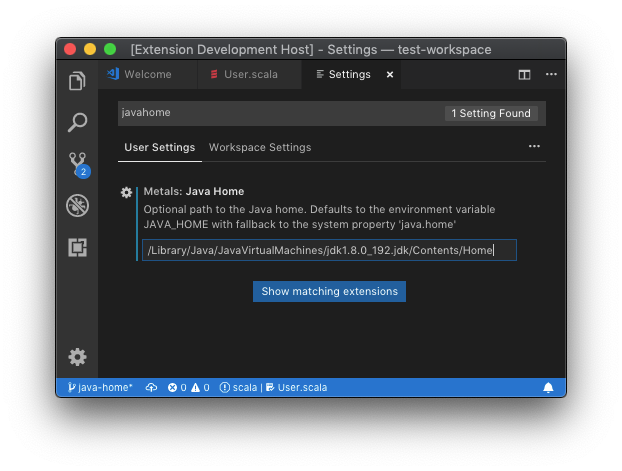 Eclipse OpenJ9 and Java 11 are not supported, please make sure the JAVA_HOME environment variable points to valid Java 8 installation. macOS, Linux or Windows. Metals is developed on macOS and every PR is tested on Ubuntu+Windows. Scala 2.12 and 2.11. Metals works only with Scala versions 2.12.8, 2.12.7, 2.12.6, 2.12.5, 2.12.4, 2.11.12, 2.11.11, 2.11.10 and 2.11.9. Note that 2.10.x and 2.13.x are not supported. Install the Metals extension from the Marketplace, search for "Metals". Make sure to disable the extensions Scala Language Server and Scala (sbt) if they are installed. The Dotty Language Server does not need to be disabled because the Metals and Dotty extensions don't conflict with each other. Next, open a directory containing a build.sbt file. The extension activates when a *.scala or *.sbt file is opened. The first time you open Metals in a new workspace it prompts you to import the build. Click "Import build" to start the installation step. "Not now" disables this prompt for 2 minutes. "Don't show again" disables this prompt forever, use rm -rf .metals/ to re-enable the prompt. Behind the scenes, Metals uses Bloop to import sbt builds, but you don't need Bloop installed on your machine to run this step. Once the import step completes, compilation starts for your open *.scala files. Once the sources have compiled successfully, you can navigate the codebase with goto definition. By default, Metals runs an embedded sbt-launch.jar launcher that respects .sbtopts and .jvmopts. However, the environment variables SBT_OPTS and JAVA_OPTS are not respected. Update the "Sbt Script" setting to use a custom sbt script instead of the default Metals launcher if you need further customizations like reading environment variables. The "Import build" step can take a long time, especially the first time you run it in a new build. The exact time depends on the complexity of the build and if library dependencies need to be downloaded. For example, this step can take everything from 10 seconds in small cached builds up to 10-15 minutes in large uncached builds. Consult the Bloop documentation to learn how to speed up build import. When you change build.sbt or sources under project/, you will be prompted to re-import the build. To manually trigger a build import, execute the "Import build" command through the command palette (Cmd + Shift + P). Execute the "Run Doctor" through the command palette to troubleshoot potential configuration problems in your workspace. The VS Code plugin uses by default the JAVA_HOME environment variable (via find-java-home) to locate the java executable. Metals only works with Java 8 so this executable cannot point to another version such as Java 11. To override the default Java home location, update the "Java Home" variable to in the settings menu. If this setting is defined, the VS Code plugin uses the custom path instead of the JAVA_HOME environment variable. To globally configure $JAVA_HOME for all GUI applications, see this Stackoverflow answer. If you prefer to manually configure Java home through VS Code, run the following command to copy the Java 8 home path. .jvmopts file in the workspace directory. JAVA_OPTS environment variable, make sure to start code from your terminal when using this option since environment variables don't always propagate correctly when opening VS Code as a GUI application outside a terminal. "Server Properties" setting for the Metals VS Code extension, which can be configured per-workspace or per-user. The Metals server places logs and other files in the .metals/ directory. The Bloop compile server places logs and compilation artifacts in the .bloop directory. It's recommended to ignore these directories from version control systems like git. Run the "Explorer: Focus on Outline View" command to open the symbol outline for the current file in the sidebar. Run the "Open Symbol in File" command to search for a symbol in the current file without opening the sidebar. As you type, the symbol outline is also visible at the top of the file.